This comic caught my eye this week, since I am a huge Obama fan. I grabbed it on impulse, and only after staying at the store and waiting for Marty and Mike to finish their browsing, did I pick up the companion issue about John McCain. Both comics seem intended to tell snippets of the life story and key political turning points of the two most prominent 2008 presidential candidates. 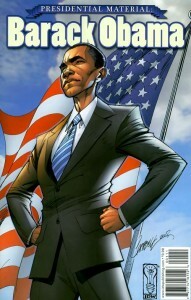 Like me, the creators of these comics seemed to be enamored with Obama, focusing on his childhood in Hawaii, the struggles that his mother and grandmother faced with limited incomes, his strong potential in school, and his connection to outsiders like “the Marxist professors and structural feminists and punk-rock performance artists” in college. I nearly swooned at the idea of my president being influenced by structural feminists. His introduction to his wife as a respected professional colleague who had grown up on Chicago’s South Side was really sweet. They both come off as fiercely intelligent and committed to social activism, which again made me want to squee. On the whole, I came away knowing a little bit more about Obama’s personal past, but mainly just reinforcing the positive views I already held, which was fine by me. McCain’s comic was piled up at the comic shop, seemingly untouched. His cover is a little bit more unsettling, and the content included both a respectful account of his wartime experience and his association with past scandals. There was a lot in here that I didn’t know about McCain’s history, which probably reflects more on my lack of interest than on any deep reporting conducted by the writers. There are references in the back of the comic to biographical sources, but they are very vague and could not be used to substantiate any of the details. To me, this comic tells the story of a man who has lived a long and varied life, who has a hot temper, who has been implicated in scandal (he cheated on his first wife, and had close ties to one of the famed Savings & Loan architects as a senator back in the 80’s). One of the other tidbits that stuck in my brain is that his great-grandfather was a slave owner who died fighting for the South in the Civil War. I know that it’s not fair to hold that against his descendant, and we’ve had many southern presidents whose family history I have not questioned. 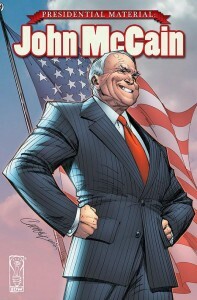 The comic also details several of the principled stands that McCain took during the 2000 presidential primary that he has since contradicted. This includes his opposition to tax cuts aimed at the very wealthy, campaigning with Jerry Fallwell (whom he had earlier termed as an “agent of intolerance”), and his earlier abhorrence of dirty campaigning. I came away from this comic with a slightly dimmer, but more nuanced, view of John McCain as a person, which reinforced my desire to see him far from the highest office in the land. I found these interesting, but not scholarly or impartial, nor likely to change anyone’s existing political convictions. This entry was posted by florence	on Wednesday, October 15th, 2008 at 10:00 pm and is filed under issues. You can follow any responses to this entry through the RSS 2.0 feed. You can leave a response, or trackback from your own site. A new announcement for a Sarah Palin comic from the same company. Apparently it’s part of a line of comics about influential women. I like the idea, but don’t know if I’ll be buying this one.